Who should read this primer? The intended audience for this primer includes stakeholders from state and local departments of transportation, metropolitan planning organizations, transit agencies, and other agencies that may be involved in an integrated corridor management (ICM) effort. Additionally, this primer is intended to inform traffic incident management (TIM) stakeholders in major urban areas of the benefits they can expect to realize from greater integration with ICM. This includes TIM partners in transportation, law enforcement, fire and rescue, emergency medical services, towing and recovery, and communications. Transportation corridors often contain underutilized capacity in the form of parallel roadways, single-occupant vehicles, and transit services that could be better leveraged to improve person throughput and reduce congestion. Facilities and services on a corridor are often independently operated, and efforts to date to reduce congestion have focused on the optimization of the performance of individual assets. The vision of integrated corridor management (ICM) is to achieve significant improvements in the efficient movement of people and goods on transportation networks through aggressive, proactive integration of existing infrastructure along major corridors. By applying an ICM approach, transportation professionals manage the corridor as a multimodal system and make operational decisions for the benefit of the corridor as a whole. Most ICM strategies to date have focused on improving passenger travel, and ICM stakeholders have included public transportation agencies such as State and local departments of transportation (DOT), metropolitan planning organizations (MPO), and transit agencies. Yet our Nation's busiest freight corridors also run through urban areas that carry millions of commuters, leisure travelers, and goods on increasingly crowded roadways and transit systems. The movement of people and goods is negatively impacted when traffic incidents occur. Traffic incident management (TIM) programs provide a proven way to minimize the impact of traffic incidents and improve the safety of motorists and incident responders alike. Adding definition to the relationship between ICM and TIM efforts will improve the integration of TIM stakeholders, issues, and solutions into the ICM process. ICM combines two fundamental concepts: active management and integration. Active management involves monitoring and assessing the performance of the system and dynamically implementing actions in response to fluctuations in demand. In an ICM corridor, all individual facilities must be actively managed so that operational approaches can be altered in real-time in response to an event anywhere on the system. Figure 1. Illustration. Integrated Corridor Management involves viewing corridor assets – such as freeways, arterials,and transit – through a common lens. Institutional Integration – Involves coordination and collaboration between various agencies and jurisdictions (i.e., transportation network owners) in support of ICM, including the distribution of specific operational responsibilities and the sharing of control functions in a manner that transcends institutional boundaries. 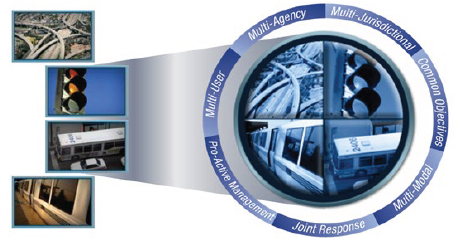 Operational Integration – Involves the implementation of multi-agency transportation management strategies, often in real-time, that promote information sharing and coordinated operations across the various transportation networks in the corridor and facilitate management of the total capacity and demand of the corridor. Technical Integration – Provides the means (e.g., communication links between agencies, system interfaces, and the associated standards) by which information, system operations, and control functions can be effectively shared and distributed among networks and their respective transportation management systems, and by which the impacts of operational decisions can be immediately viewed and evaluated by the affected agencies. Cannot be accomplished without institutional and operational integration. Active and integrated corridors can be viewed along a continuum. For example, some corridors may actively manage some or all of their assets, but not in an integrated way. The ultimate goal of ICM is to for corridors to progress along the continuum to become as active and integrated as possible. Figure 2. Illustration. 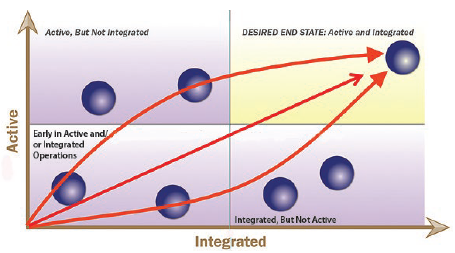 The active and integrated continuum. The United States Department of Transportation (USDOT) started the ICM Research Initiative in 2006 to explore and develop ICM concepts and approaches and to advance the deployment of ICM systems throughout the country. Initially, eight pioneer sites were selected to develop concepts of operations (ConOps) and system requirements for ICM on a congested corridor in their region. Three of these sites went on to conduct analysis, modeling, and simulation (AMS) of potential ICM response strategies on their corridor. In the final stage, two sites — the US-75 Corridor in Dallas, Texas and the Interstate 15 (I-15) corridor in San Diego, California — were selected to design, deploy, and demonstrate their ICM systems. The Dallas and San Diego demonstrations "went live" in the spring of 2013. Each demonstration has two phases: the first is design and deployment, and the second is operations and maintenance. Both sites chose to develop a decision support system (DSS) as a technical tool to facilitate the application of institutional agreements and operational approaches that corridor stakeholders agreed to over a rigorous planning and design process. What could an integrated corridor management (ICM) response plan look like? A major incident has occurred on the freeway in an ICM corridor. Travelers are advised via dynamic message sign and other traveler information sources (e.g., 511) to take a parallel route or shift to transit, where there is spare capacity. Signal timing on the parallel route is changed to better manage the flow of the detoured traffic, and transit operators prepare for increased volumes by adding more buses along the impacted route. Although the DSS approach at each site differs slightly, the basic process is similar. The DSS gathers traffic data from an array of intelligent transportation systems (ITS) in the network and uses this information to forecast future conditions on the corridor. If an event (recurring or non-recurring) occurs that is predicted to meet pre-established congestion thresholds, the DSS generates response plans. These plans contain combinations of multimodal strategies to address specific congestion scenarios. Response plans are based on detailed business rules that establish the conditions under which assets can be used. This may vary based on the magnitude of the event, time of day, congestion levels on the network, etc., as well as due to policy constraints. The DSS recommends and ranks response plans by running a simulation to determine which plan will most effectively address the congestion. Operating agencies are alerted to either accept or reject the plans; if accepted, the plan will be implemented. The USDOT is conducting independent "before-after" analyses to evaluate the benefits of ICM on transportation operator situational awareness, response and control, traveler information and overall corridor performance at each site. The experiences and lessons learned from the demonstration sites are being actively shared with the transportation community so that regions interested in ICM can leverage the knowledge gained to better shape a successful deployment for their corridor(s). Although the demonstration sites provide valuable insights into the necessary components of building an ICM system, they do not represent the only way to implement ICM. There is no "one-size-fits-all" approach to ICM, since the circumstances of a particular corridor will vary based on traffic patterns, agency dynamics, available assets, and a host of other factors. Traffic incidents span a continuum of characteristics from debris on the side of the road to full- scale, multi-vehicle crashes involving motorist fatalities. Traffic incident management is the coordinated response to these traffic incidents that involves responders from multiple disciplines working side-by-side to safely and efficiently clear traffic incidents. The stakes are high. Without a coordinated traffic incident management response, the safety of motorists and responders is compromised and congestion builds as other motorists try to navigate past the incident. Consensus Building – to create a shared understanding among TIM responders of the importance and value of coordinated incident response to the goals of increased safety for motorists and responders alike as well as improved transportation system operations. Research and Development – to identify tools and technologies that will improve incident detection, response, and clearance and enhance the safety of responders and motorists. Best Practices – to identify, quantify the value of, and promulgate the most promising strategies for coordinated incident response. One of the challenges inherent in TIM is that there are the numerous stakeholders involved who have myriad and often divergent priorities. Although certainly not limited to these, the primary disciplines involved in traffic incident response are described in Table 1. Each TIM program is unique and is typically structured to meet the needs of its region or State; as such the involved stakeholders may vary, as does the lead or champion organization for each program. Often first responder on scene, LE personnel will secure the incident scene; provide initial emergency response if there are injuries; direct traffic around the incident; conduct accident investigation. Treat injuries; prepare and transport more seriously injured motorists to hospital. Secure the incident scene; establish traffic control around incident; provide motorist assistance; incident clearance; restore traffic flow after incident cleared. Removal of damage vehicles and debris; incident scene clean-up. Transportation Management Center (TMC) – Incident detection, verification; identify alternate routes; provide motorist information. Public Safety Dispatch – Receive and transmit incident information; dispatch public safety incident response. Traffic Media – Inform motorists of incidents, incident clearance times and alternate routes. Contain and clean up any hazardous material spills associated with traffic incidents. Given the critical role of multi-discipline coordination in traffic incident management, a number of stakeholder coalitions have emerged over the years to advance consensus building, participate in TIM research and development, and disseminate best practices. One of the first such groups was the National Incident Management Coalition (NIMC), which focused on building consensus for coordinated incident management through a series of regional education and outreach conferences held around the United States. The successor to the NIMC was the National Traffic Incident Management Coalition (NTIMC), which was formed following a 2002 national conference on the importance of multidisciplinary traffic incident management programs. The NTIMC membership was comprised of representatives from the national associations representing the various TIM stakeholder groups. Traffic Incident Management (TIM) Partnerships and Programs. Multidisciplinary National Incident Management (NIMS) and TIM Training. Goals for Performance and Progress. Recommended Practices for Responder Safety. Response and Clearance Time Goals. Multidisciplinary Communications Practices and Procedures. Interoperable Voice and Data Networks. Prompt, Reliable Traveler Information Systems. Partnerships with News Media and Information Providers. One of the most important products to come out of the NTIMC was the National Unified Goal (NUG) for traffic incident management. The NUG has three overall objectives supported by 18 strategies (see box) which were developed and ratified by the member organizations of the NTIMC. It provides a roadmap against which local, regional and state TIM programs can be organized. From its earliest beginnings as an ad hoc activity by the various incident responders until today, when more formalized TIM programs have coalesced around the National Unified Goal, TIM continues to benefit from increased education and awareness. TIM programs are currently focused on measuring and improving performance through tools such as FHWA's Traffic Incident Management Self-Assessment and the emerging TIM Capabilities Maturity Framework. TIM practitioners across the country are also benefitting from standardized TIM training5 developed as part of the Second Strategic Highway Research Program (SHRP2). One of the first products of the SHRP2 Reliability Program track was a national TIM responder training curriculum. The resulting multidisciplinary training course promotes a shared understanding of the requirements for quick clearance and provides for the safety of motorists and responders alike. Through deployment of the training around the country—as a 2-day train-the-trainer course, a 4-hour student course, or through e-learning—the common set of core competencies will ensure improved TIM practices by all responder disciplines today and for the future. This primer will describe how TIM partners and activities can be incorporated into ICM, where important synergies exist between the two, and how to capitalize on the shared goals of TIM and ICM. When traffic incidents are cleared more safely and efficiently, the opportunity for secondary incidents is greatly reduced and traffic flow is restored more quickly. The integration of TIM data—such as anticipated incident duration, incident and roadway clearance times, occurrence of secondary incidents, alternate routes, etc.—allow for more robust ICM decision support systems (DSS). The involvement of TIM stakeholders in ICM provides for broader awareness of potential corridor impacts from planned special events such as sporting events, concerts, major conventions, visiting dignitaries, etc. The unique perspective of the varied TIM partners can provide valuable insights on where motorists should be rerouted when incidents occur. Expedited and safer access for public safety and emergency response agencies to victims and communities in need of service. When incidents do occur, ICM strategies can be deployed to clear the way for public safety and emergency response personnel and vehicles to more quickly approach the incident, safely respond to those in need, and transport victims to care. ICM provides the resources for improved traveler information, allowing motorists to understand incident impacts on travel times and make alternate route or modal choices. ICM enhances the ability to reroute and divert traffic away from an incident scene and potentially move that traffic to other facilities or modes. Not only does this reduce the incident queue, thereby minimizing the potential for secondary incidents, it greatly improves safety for responders at the scene and the motorists involved in the incident. Incident scenes can then be cleared more efficiently and traffic flow restored more quickly. In those areas where the TIM program may not be as well established or formalized, ICM provides a platform for collaboration among TIM partners. With TIM efforts focused on the specific corridor, relationships among TIM stakeholders are built and can then be capitalized on to expand the TIM program beyond the corridor. Planning for ICM often leads to increased awareness and a more accurate inventory of available traffic management and transportation operations infrastructure, systems, and assets. There are ample opportunities for integrating traffic incident management (TIM) into integrated corridor management (ICM) processes. In areas that have existing TIM teams and structure, those platforms can serve to initiate integration discussions. Along with opportunities, there are also several challenges to overcome, such as limited resources or different priorities among stakeholders. Table 2 highlights some of the key opportunities and challenges related to institutional, operational, and technical integration. The following sections explore opportunities and challenges in those three areas in more detail. Table 2. Opportunities and challenges associated with integrated corridor management and traffic incident management. The first step for successful integration of ICM and TIM strategies is cooperation and coordination among partner agencies and stakeholders to transcend institutional boundaries. Formal agreements need to clearly define the roles and responsibilities of the involved agencies and stakeholders. Fostering existing relationships between transportation agencies and TIM professionals can be a starting point to complete an initial feasibility assessment and systems engineering analysis for integrating TIM and ICM. Existing TIM teams can provide leverage to move forward with ICM opportunities. In regions where TIM teams currently exist, meetings, training, or other TIM gatherings can serve as a platform for discussions on how to integrate ICM and TIM strategies. This platform can also serve as an opportunity to share data, advance performance measures, and collaborate on planning efforts. Regions that have large planning organizations, like metropolitan planning organizations (MPO), can also use existing meeting platforms to begin ICM and TIM integration. Bringing TIM and ICM professionals together during the planning stage ensures that needs for both disciplines are fully understood. It also facilitates a smoother integration of joint strategies. In regions where first responders are co-located in a facility with transportation facility operators, like a traffic management center (TMC), barriers to communication and coordination are removed and facilitation between the disciplines may improve. In areas where these stakeholders are not co-located there may be other opportunities to improve communication. The towing and recovery industry is a key component of TIM, and opportunities to improve tow operator response time and clearance times could be gained through formal agreements or region-wide tow boards. Establishing towing protocols and creating formal agreements sets the stage to more easily implement advanced ICM and TIM strategies that incorporate the towing and recovery industry on a region-wide basis. While both ICM and TIM stakeholders can benefit from integrating strategies, the process is likely to face challenges. In areas that do not have a strong TIM program in place, it will be challenging to move forward with ICM integration without first establishing a TIM program for the subject corridor. A key element in institutional integration is clearly defining the roles and responsibilities of partner agencies and stakeholders. Without a TIM program or other foundation platform in place, defining these roles and responsibilities, and reaching agreement among responsible parties, may be challenging. TIM partners often have different priorities than ICM partners, which can lead to disagreement about how to obtain and spend available funding. ICM strategies tend to focus on achieving mobility goals through technology-based solutions and longer term planning. First responders are more focused on those immediate actions at an incident scene that are necessary to ensure the safety of responders and motorists. In addition, TIM resources and staffing may be limited. These limitations may hinder the ability and willingness of TIM partners to further integrate ICM activities and lead to missed opportunities. Under these circumstances, the ICM project leaders need to effectively convince TIM partners that ICM integration will benefit them without extra burden. Another institutional challenge is how to reach agreements on sharing data between agencies that accounts for existing security and privacy issues. For example, traffic signal systems for many agencies operate on a secure network with policies in place that limit who can access the network and what level of access they have. These policies need to be addressed so that relevant information can be shared in real-time with necessary partners. Regular communication and meetings with partner agencies is essential. Following the systems engineering approach may be difficult at first but pays off in the end. Determining how to process and use the robust data collected can be challenging. Performance measures and evaluation criteria should be considered early in the process. Agencies should consider post-deployment operations and maintenance when designing their systems particularly with respect to stakeholder roles and responsibilities. Assets – All of the potential networks, routes, systems, and capabilities along the corridor that could potentially be used as part of a response. Availability – The status of the assets and whether they are currently available for use as part of a response. Availability can be limited based on time of day and other factors; for example, it may be impermissible to re-route traffic along a certain arterial during school zone hours. Scale of Response – A response may be conservative, moderate, or aggressive based on the predicted impact of an event, which is defined by an integrated performance metric (e.g. person-miles traveled). The assets that will be used may vary based on the scale of the response. For example, at the Dallas demonstration site, travelers are advised to take transit only if a major incident of a pre-defined magnitude occurs on the freeway. ICM and TIM strategies provide numerous opportunities for operational integration as described in the following subsections. Involving ICM stakeholders in TIM meetings provides a platform to plan and present new ideas. TIM teams may hold regular meetings or after action reviews in which ICM stakeholders can participate. Providing a platform for the different partners to communicate can lead to improved understanding of the capabilities each partner can offer and the challenges these partners face. It can also create opportunities to move forward together. Meeting in advance of a known event and coordinating response efforts can ensure minimal disruptions to corridor operations. Additionally, after action reviews can lead to improved performance from all partners during the next similar event or incident. The joint meetings can also be used to advance the development of performance measures, share data, and determine how each partner can use the data to improve operations. Typically a concept of operations is developed for each ICM corridor to provide a stakeholder view of the system in a non-technical manner with a focus on user needs, activity-based operations objectives, performance measures, roles and responsibilities, and institutional agreements. Including TIM stakeholders in the Concept of Operations development process provides a key opportunity to discuss the integration of ICM and TIM strategies. One or more incident scenarios, such as those included in the Maryland I-270 corridor ICM concept of operations,7 helps establish how the two program areas will work together in practice. The I-270 ICM concept of operations outlines examples for both a minor and major traffic incident and clearly defines the roles and responsibilities of all involved agencies through the duration of each incident response. Integration of TIM stakeholders into the development of the ICM ConOps also allows the opportunity to discuss more technical issues, such as how data and video will be shared among partners. Similar to the concept of operations discussed above, many regions also have TIM strategic plans that identify programs and actions to improve incident response. TIM strategic plans are typically region-wide or state-wide and often lead to a specific set of actions for implementation. Incorporating ICM strategies into TIM strategic plans provides a medium in which to promote and prioritize specific strategies. TIM strategic plans can also document roles and responsibilities and establish lead agencies in charge of implementing specific action items. Pairing ICM resources with TIM dispatch capabilities can decrease incident detection and improve verification and response times. Allowing incident dispatchers to use traffic operation tools such as closed circuit television cameras to verify incident location, severity, and tow requirements enables responders to arrive at the scene well informed and improves incident response and clearance times. Through on-the-job experience, TIM stakeholders can likely provide insights to ICM partners about high incident locations. These are locations to target for additional monitoring to enable early incident detection. TIM stakeholders may also be able to provide insight regarding where it would be useful to place dynamic message signs to re-route travelers during an incident. Expanding TIM safety service patrol coverage to include arterials (in addition to freeways) also provides an opportunity to integrate TIM with ICM. Expanding these patrols to arterials will increase operators' knowledge of conditions and incidents on facilities adjacent to freeways and will facilitate incident response efforts on arterials. The patrols also act as a mobile resource for public safety. If TIM safety service patrols expand to include arterial routes parallel to the freeways, public assistance on arterial routes will be made available. ICM partners may be able to provide better information to first responders traveling to or from the scene. Providing improved information to first responders, monitoring their progress while en route, and even adjusting traffic signal timing to get first responders to the scene (or hospital) faster are all elements within reach if ICM and TIM strategies are integrated. Additionally, most traffic signals include emergency vehicle priority, giving the emergency vehicle the green phase while truncating other phases early. Although preemption is a standard feature in traffic signals, the emergency vehicles allowed priority can vary by agency and region. For example, in some areas the preemption may apply to fire engines, ambulances, police vehicles, service patrols, and even maintenance vehicles, whereas other areas may only allow fire and police vehicles to gain signal priority privileges. An integrated ICM and TIM approach could involve first responder vehicles being informed of the optimal ingress and egress routes, ensuring that the route includes traffic signals with priority preemption. Coordinating work zone management and construction projects with TIM and ICM partners provides a mechanism to ensure that parallel route options are available and that emergency vehicle mobility in the vicinity of a work zone is optimized. Transportation management plans (TMP) address work zone safety and mobility and are required by FHWA for any projects receiving Federal funding. Expanding the TMP to include TIM stakeholders and applying it to a broader range of projects can improve operations across the transportation network as a whole by keeping all parties better informed. Many States use collaborative mapping tools to identify work zone locations. This allows for coordinated construction efforts and an expanded ability to evaluate impacts to traffic. Oregon - Corridor-level transportation management plans ensure at least one major north-south corridor and one major east-west corridor are left unrestricted for freight and passenger travel at all times. New York/New Jersey/Connecticut Region – This region formed the Transportation Operations Coordinating Committee (TRANSCOM), which consists of a coalition of 16 transportation and public safety agencies. TRANSCOM helps facilitate construction coordination among member agencies, holding annual meetings where upcoming construction projects are discussed. TRANSCOM contacts member agencies with recommendations if adjustments to traffic operations are needed based on real-time construction and incident information. R.E.S.C.U.M.E. was developed by the Dynamic Mobility Application program through the Intelligent Transportation Systems Join Program Office and U.S. Department of Transportation Research and Innovative Technology Administration. Incident Scene Pre-Arrival Staging Guidance for Emergency Responders (RESP-STG) – provides first responders with situational awareness information while en route and at the scene to help them make more informed decisions in regard to routing and staging. Incident Scene Work Zone Alerts for Drivers and Workers (INC-ZONE) – alerts both drivers and workers when a vehicle is approaching a work zone at an unsafe speed or trajectory. Emergency Communications and Evacuation (EVAC) – alerts evacuees using their own transportation about current roadway conditions, food, lodging, gas, and other essentials. EVAC also identifies and locates evacuees who are more likely to require guidance and assistance and provides information to identify services and available resources. Advanced Automated Crash Notification Relay (AACN-RELAY) – communicates a wealth of data to a roadside hotspot that can then be forwarded to first responders or other agency personnel. Information could include: exact location of the vehicle, position of the vehicle (upright or overturned), whether the airbags deployed, vehicle speed just prior to the crash, whether the gas tank was full, number of occupants, medical history of occupants, and cargo content for commercial loads, just to name a few of the available details. The ICM analysis, modeling, and simulation (AMS) methodology is a comprehensive approach that analyzes the impact of a strategy on the entire corridor (freeway, arterials, and even transit system). Agencies can use ICM AMS to determine whether particular strategies will improve performance and to assess planned ICM strategies. Currently, little AMS has been conducted for TIM-related strategies. Incorporating TIM strategies into the ICM AMS could provide a robust tool for modeling the comprehensive benefits of different TIM strategies. Analysis, modeling and simulation was recently used to evaluate strategies at the two integrated corridor management demonstration sites: US-75 in Dallas, TX and I-15 in San Diego, CA. Source: U.S. Department of Transportation, Intelligent Transportation Systems Joint Program Office, "ICM Pioneer Sites–Dallas, Texas" web page. Available at: http://www.its.dot.gov/icms/pioneer_dallas.htm. See also, U.S. Department of Transportation, Intelligent Transportation Systems Joint Program Office, "ICM Pioneer Sites–San Diego, California" web page. Similar to institutional challenges, integrating these operational strategies will be particularly challenging in regions that do not have a formal TIM team or program. Funding and staffing is another challenge facing operational integration. Often the operational opportunities include an element of TIM staff time and resources, especially in the beginning, and some of the operational strategies may have a steep learning curve. Limited TIM staff and resources is a likely barrier to implementing the operational strategies discussed in the previous section. Once a strategy is implemented, it may be a challenge to ensure that funding is available for ongoing maintenance and operations. Effective communications, particularly regarding early notification and on-scene communication, can often be difficult to coordinate between numerous stakeholders. This can be strengthened by defining clear roles and responsibilities in the concept of operations for all stakeholders and holding post-incident debriefings to identify successful practices and areas for improvement. The final step necessary for integrating ICM with TIM is technical integration. Technical integration provides the means for implementing operational strategies, such as communication links and system interfaces. It includes technical resources for sharing, viewing, and using real-time information to make decisions. Technical integration can pave the way for improved data collection as well as being key to advancing some of the operational opportunities discussed in the previous section. Several ICM strategies rely on a solid communication infrastructure with the ability to monitor and respond to real time data. With that technology and infrastructure in place, TIM responders could develop a process for data collection and archiving if one is not already in place. Sharing data between incident responders and ICM stakeholders presents a wealth of opportunities for all stakeholders. For example, ICM could provide a forum for TIM responders to develop a consistent process for data collection and archiving. By combining data from both incident responders and ICM stakeholders, the quality of real-time traveler information will improve, resulting in better information about rerouting to avoid incidents and incident-related delay. With the rise of smart phones, other mobile devices, and connected vehicles, there are endless opportunities to improve communications and share data with the traveling public. By doing so, real-time conditions and rerouting recommendations will be instantly available, enabling travelers to make informed decisions and optimizing the transportation network. The private sector already has applications that provide real-time traffic and incident information and can recommend rerouting options for travelers. One application, WAZETM, is a crowd- sourced application, relying on users to input incidents and hazards. That application then provides travelers with alternate route options and informs them of the travel time to their destination using each route option. Collaborating with the private sector, such as providing an open source clearinghouse of public sector real-time incident data, could result in other private sector apps that reduce congestion during incidents. Roadway clearance time (time between incident awareness and confirmation that all lanes are open to traffic). Incident clearance time (time between incident awareness and when the last responder left the scene). TIM performance measures data could be used to supplement and create a more robust ICM decision support system (DSS). Creating a robust and shared database between ICM partners and TIM stakeholders may be challenging when field equipment—such as detection devices and communication infrastructure—are insufficient. Without field devices in place, several of the operational strategies cannot be implemented. Or, if they are implemented, the strategies will not realize their full potential. In a world of constantly advancing technology, it can be a challenge for agencies to evaluate and identify the best tools to meet the region's needs and allow the system to expand, which can complicate the implementation process. Additionally, there is little data that quantifies a return on investment in terms of safety when integrating data between ICM and TIM, so TIM stakeholders may be hesitant to focus limited resources on such efforts. TIM stakeholders are more likely to place a higher need on investing in tangible first responder equipment than data integration. Figure 3. Illustration. 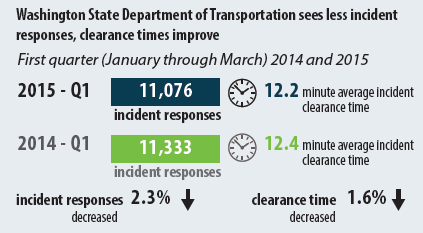 Washington State Department of Transportation Gray Notebook Performance Measures. Source: Washington State DOT, The Grey Notebook, Edition 59, Quarter ending September 30, 2015 (Olympia, WA: WSDOT, 2015). Available at: http://www.wsdot.wa.gov/Accountability/GrayNotebook/navigateGNB.htm. Another challenge to technical integration is determining how to process and use the large quantity of data that will be available. Once the data is available, resources need to be allocated to determine how it is processed, whether the data should be published, and where the data is stored. "Collecting and processing the necessary data can be one of the most time-intensive aspects of planning and designing an ICM system, and figuring out how to use that data post-deployment can be a challenge." Integrated corridor management (ICM) and traffic incident management (TIM) have at their core a shared objective – safely and efficiently moving people and goods. ICM focuses on the efficient utilization of transportation infrastructure and assets to maximize the capacity of existing corridors through multi-modal, active management of all assets along that corridor. TIM provides for safe, quick clearance of traffic incidents that protects motorists and responders while quickly restoring traffic flow and reducing the occurrence of secondary incidents. The benefits to ICM and TIM from integration are fairly intuitive. Better managed corridors mean less risk of traffic incidents and a safer, more efficient response environment for TIM stakeholders when incidents do occur. Coordinated traffic incident response minimizes impacts from the incidents that do occur, and TIM programs can provide greatly enhanced incident data for an ICM decision support system. The opportunities for ICM and TIM integration are numerous and in many instances are easily realized, such as involving ICM stakeholders in regular TIM meetings and sharing incident data for improved traveler information. There are challenges to integration of ICM and TIM, particularly in those areas where the TIM program is not institutionalized among TIM responders. In such areas, ICM may actually provide the platform for coalescing TIM partner activities on the corridor, providing the opportunity for further expansion once the relationships are built. Despite the challenges, the objectives of ICM and TIM are so closely related that opportunities to integrate the two should be capitalized on whenever possible.